On Friday, the inspirational duo Rebecca Minor and Nye Armstrong shared their Ramadan Reflections. Today I'm delighted to have them back to explain why charity is so important in Islam and to discuss their exciting fund-raising project Water For All with Charity:Water. Why is charity important in Islam? [Rebecca] I've taught the kindergarten Islamic Studies section of Sunday school for the past four years at my masjid [mosque]. While teaching children about the five pillars of Islam, I've found the easiest way to explain giving zakat (the practice of charitable giving by Muslims based on accumulated wealth) is to start with the fact that Allah has created people in different ways. We speak different languages, we have different colored skin, we dress in different ways. Another way in which people differ is by the amount of wealth they own*. I go on to explain to my students that some people in this world have a lot of money. There are other people who have some wealth and other people that have very little or maybe no wealth. Allah has also told us that if we have money, it is our job to share with those who have less. *Muslims believe that all wealth is from Allah and that we are mere holders of this trust. [Nye] It is hard to talk after Becca just dropped some knowledge on us... but I will give it the old college try. Part of the reason we fast is to feel empathy for others who live their life without the same blessings we have been given. What are we supposed to do with the empathy we gain from fasting? Look at people and say “I know how they feel...” and then go on with our day? Nope. With the knowledge and empathy we gain we should help those who are less fortunate. We have had a small taste of what their lives are like and God willing we can help ease their suffering. It can be donating money, time, clothing... the list can go on forever. We are so blessed. Thank God. Why do Muslims give to charity? Especially during the month of Ramadan? [Rebecca & Nye] The month of Ramadan helps us reflect on the blessings that we have been given. Water is one of those blessings. It is also one of the items we purposefully refrain from during the daylight hours of sunrise to sunset. Fasting teaches us to appreciate the gifts we have been given and increase our desire to share with those who are less fortunate. [Nye:] Two things have stood out for me. Quran Weekly and charity: water. Quran Weekly’s gems are such a blessing to me. They are little nuggets that help me stay focused on the Quran. When you read words, they can slip past you without you being able to retain meaning. Quran Weekly’s Gem’s help me pull my concentration and let me end the night feeling like I accomplished something. And charity: water is an amazing charity that I have been fundraising for with Becca. Our goal now is to raise $20,000 before the end of Ramadan. [Rebecca:] I’m going to echo Nye’s response on this one. QuranWeekly has become a really important part of my life. I feel so honored and appreciative for the opportunity to work with the organization. The people who volunteer have become close friends and their videos have given me such beautiful insight into my faith. The QuranicGems series has become something I looked forward to and have been able to incorporate into my daily routine because they are short and sweet and packed with such amazing information and take away points that I find myself talking about and thinking about them days later. This year Nye and I decided to do a Ramadan charity project. This year we chose to raise money for a water project through charity:water. Alhamdulillah we met our first goal within the first two weeks and have since set a second goal that inshAllah I am hopeful we can achieve. Lifting a jerrycan is harder than it looks! Why did we choose charity: water? [Nye:] Charity: water has two things which set it above the rest. Transparency and the 100% Model. 100% of a person’s donation goes directly to the field. The donation isn't used for salaries, rent, or any kind of overhead. And then the transparency aspect comes into play. They will keep us up to date in terms of project completion and will send us photos and GPS coordinates so we can see the exact community we helped. You can see how the money you donated helped. [Rebecca:] After looking at several organizations, I was first drawn to charity:water because of the layout of their website. It was clean and organized and very visually appealing. Perhaps it’s the teacher in me but that was a huge plus in my book. Once I did a little more research, I couldn't get over the fact that 100% of donations directly fund water projects. After talking with Nye and hearing that we would be able to see pictures and have communication with the organization throughout the project, I was sold. 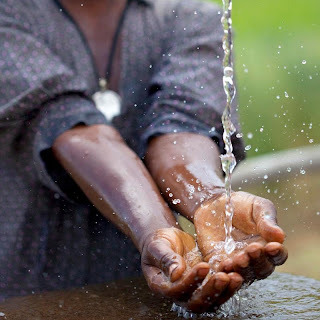 What has the experience of working with Charity Water been like? [Nye & Rebecca:] Amazing. They are a really great group of people. They have said that working with us on this campaign has inspired and rejuvenated them. The work atmosphere is really refreshing. During the last ten days of Ramadan one person for each day will be fasting to help support our campaign. They will be blogging and vlogging their experiences. Not only is that amazing solidarity with our campaign, but a really great experience for them. I can’t wait to see what insights they share with us! So exciting. What is your favorite thing about working with each other? [Nye:] What I love about Becca is that it is easy. It is really easy to be myself around her. That is something I find very rarely with people. We have similar upbringings and paths towards Islam. Yet, at the same time we are exact opposites. She has a structured way of thinking that counteracts my meandering mind. What is nice about that is I may take us down some winding roads but she keeps us going in the right direction. Kindness oozes from her and it isn’t fake in any way. And I don’t know where she gets the time to do all the things she volunteers for. I think Becca lives in another dimension where time exists along a different spectrum. She does so much and I don’t think she knows how to say the word ‘NO’. We joke around about how she is a special education teacher... and I was in special education (and probably still should be). After we met, she was more of a Yoda figure for me. And over the few years I have known her she has become one of my very best friends. What you see in the videos is only a slice of how truly amazing she really is. MashaAllah. She thinks that she is boring, but I don’t find that to be the case at all. Don’t let her proper ways fool you... she has a wicked sense of humor she lets peep out from time to time... when the occasion calls for it and sometimes when it doesn't. [Rebecca:] Nye keeps me on my toes. She makes me laugh so hard that I cry and that my stomach hurts. She makes me smile and reminds me of how important it is to have people in your life that make you truly happy to be around them. The way in which Nye and I met was so random, yet I know it was written for us by Allah subhanahu wa ta’ala. She has become one of my best friends and someone I care about most deeply. Nye works incredibly hard and strives to do as much good as she can. She works multiple jobs, volunteers and puts her heart and soul into her YouTube Channel, the sisters she meets and stays in contact with on the Internet and with her business - AndirunDesigns. While Nye is one of the most outgoing people I know, she is also humble. She doesn’t promote herself as she should or get the credit I believe she deserves. Nye is a very talented graphic designer. She truly is a jack of all trades. Most of all, she’s a wonderful friend. If you've been inspired by Rebecca and Nye's project, you can donate here. Each donation, whether large or small, will make a huge difference! [2:274] "Those who give to charity night and day, secretly and publicly, receive their recompense from their Lord; they will have nothing to fear, nor will they grieve." I'm following both of them in facebook. They are great ladies.